First of all, what's a mirage? Mirages are not optical illusions, as many people (and Web sites!) think. They are real phenomena of atmospheric optics, caused by strong ray-bending in layers with steep thermal gradients. Because mirages are real physical phenomena, they can be photographed. In addition, there are the recently-recognized “mock mirage” and Alfred Wegener's “late mirage” or Nachspiegelung. As these have a different optical mechanism, I like to call them pseudomirages. Because refraction displaces images primarily in a vertical plane, the various images are usually stacked up directly on top of one another. The different types are described in a little more detail here. Mirages are distinguished from other refraction phenomena such as looming (visibility of distant objects usually hidden below the apparent horizon), towering (exaggerated vertical size of images), sinking (disappearance below the horizon of objects usually seen), and stooping (images squashed together vertically), in which an object may appear distorted, but not inverted. Some of these are milder versions of the phenomena that produce mirages. It is incorrect to say (as even some textbooks do) that a mirage is an image in the wrong place, because atmospheric refraction displaces almost everything we see from its geometric position — that is, rays of light in the lower atmosphere are usually curved, because the density of air usually decreases steadily with increasing height. Thus, everything normally appears displaced slightly above its geometric or “true” position. This displacement is known as terrestrial refraction when the object is inside the atmosphere, and astronomical refraction when it is beyond the atmosphere. While these effects are usually small enough to escape casual observation with the naked eye, they are very severe problems in fields such as geodesy and positional astronomy, because they can be hundreds or even thousands of times larger than measurement errors. Sometimes people think that the erect image of a classical mirage is “the object itself,” and that the inverted one is “just a mirage,” and somehow not real. But this notion is challenged by 3-image (and other multiple-image) mirages, in which two or more erect images occur: which one, then, do you choose as “the real one”? In fact, all the images are equally genuine; every one of them is as truly “the object itself” as any other, including the inverted ones. And as all the images are in general displaced from the geometric position of the object, location is no indicator of legitimacy. Indeed, from the point of view of geometrical optics, it is the inverted images that are “real images.” And the erect images are merely “virtual images” to an opticist — including the ordinary appearance of objects, even without mirage conditions! So it is best to recognize that we are really seeing “the object itself” in every image, even when there are many of them — while bearing in mind that everything we see is slightly displaced from its “true” or geometric position by atmospheric refraction, whether there is a mirage or not. Another common misconception is that the miraged image can fill a large part of the sky, as in this old drawing. Hogwash! Mirages NEVER look like that! They're always confined to a narrow strip of sky — less than a finger's width at arm's length — at the horizon. Green flashes are colored phenomena due to the dispersion of atmospheric refraction. While every refraction phenomenon has some dispersion connected with it, the dispersion is inappreciable under most circumstances. However, certain mirages produce much larger dispersion effects; and the most spectacular of these are the green flashes. So, to understand green flashes, it is first necessary to understand mirages. The mirage of the foreground object, which resembles a chess piece, also displays multiple images: notice the repetition of both wider and narrower parts of it, at different heights. You can see that a detached image of part of this object appears above the main “chess piece” in the first 4 frames. There is a general correspondence of features in the solar and terrestrial mirages: the “chess piece” is wider in strips of the solar image that appear darker. Even though there's no green flash in this sunset, you can see that the atmospheric structures that produce mirages of terrestrial objects also distort the Sun's image. However, this example is so complex that it's difficult to sort out all the details. Mila has found another photograph that illustrates the correspondence between the distorted low Sun and miraged topography. In addition to showing that both the Sun and the mountains are so vertically stretched as to have nearly vertical sides in the same zone of altitudes, that picture has a reflection of the Sun on a pool of water in the foreground, and a “glitter path” on the water beyond it, making a very pretty composition. It's much easier to understand mirages after you have seen more of them. Fortunately, the Finnish photographer Pekka Parviainen has made a fine selection of his mirage photographs available on the Web. Take look at them if you are unfamiliar with mirages. Furthermore, Pekka now has his own site, with even more mirage pictures. A “textbook example” of a superior mirage was taken by Wim van Bochoven in late May, 2002. He has made his pictures available to me; here they are, with a description of the details. His sequence shows many characteristic features very clearly. A good collection of pictures showing Fata Morganas is available at Dave Walsh's website. He has a good mixture of pictures showing the “striated zone” that Forel says is the characteristic feature of the Fata Morgana, and more usual multiple-image superior mirages. Be sure to explore the links on his page to the larger, higher-resolution versions of this Arctic-mirage slideshow. Another site with some good images is Olaf Squarra's pages. 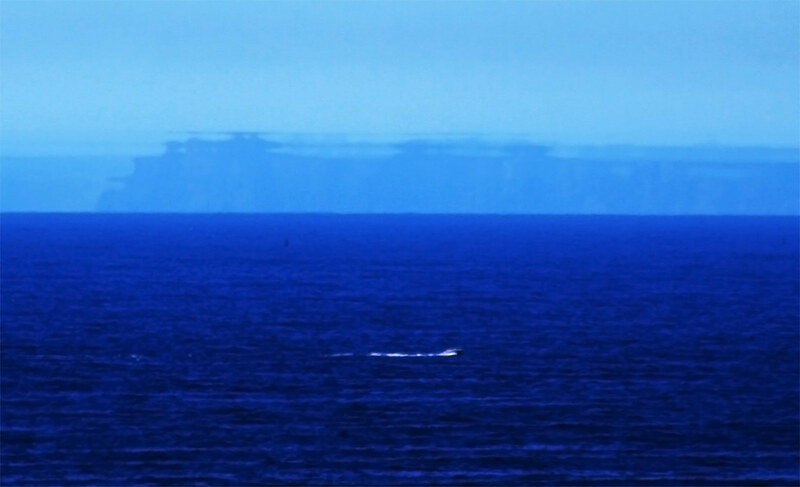 He shows a fine multiple-image mirage of the Vestmannaeyjar Islands as seen from Eyrarbakki, on the southern coast of Iceland. There is also a Fata-Morgana type of mirage of farm buildings, shown at the right side of his page; be sure to look at the enlargement. Some very nice multiple-image mirages, perhaps complex enough to count as Fata Morgana displays, were taken at the Weather Service office in Rapid City, South Dakota, at sunrise on Dec. 19, 2000. Evidently the nocturnal radiative inversion is responsible for this display. 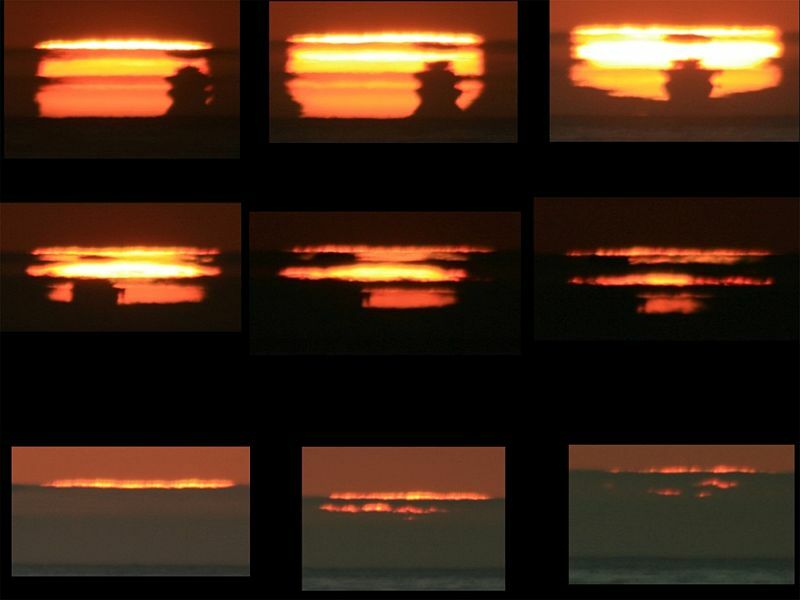 Mila Zinkova's series of pictures showing the variations in a superior-mirage display within a few minutes is also very beautiful and instructive. It shows the alternations of compressed and stretched zones in the image that characterize the “Fata Morgana” type of display. She has another fine example of this type here, as well as an animation of a superior mirage display (near the end of that last page). Mila has also pointed out a page of excellent superior-mirage images taken by C. B. Clements, showing mirages of ships at the horizon. The 3rd (uppermost) image of the 3-image mirage is evident in some of these — particularly numbers 1, 7, and 8. (This is one of those “album” pages, where you have to click on the thumbnail images to see a larger version.) If you don't want to go through all that, there's a nice big version of one of these on Les Cowley's website. Another fine set of mirage images, photographed through a telescope, is shown on the website of an Australian radio operator, who uses the associated ducts for long-distance radio communication. (See his other pages for the radio logs.) Sample his list of “Older Images” to see aditional details. Ctein has a very fine inferior-mirage picture that shows many features of these mirages very distinctly. The mirage begins at a sharply defined boundary where the line of sight meets the smooth desert floor at the critical angle; the mirage image is rather irregular near this foreground boundary (because the “reflection” occurs so close to the ground surface at first that every little irregularity in the surface produces a corresponding wiggle in the reflected image), but with increasing distance behind the boundary, the image becomes smoother (as the turning point of the rays moves upward in the air, and so becomes less sensitive to small deviations from flatness in the ground). The mirage begins close enough to the camera (only a kilometer or two away) that there isn't much atmospheric scattering in between, so the colors in the erect and inverted images are clear and distinct, and you can see how the inverted images have the same color and brightness as the erect ones — while the background is a bluish-gray because of intervening airlight. The turbulence produced by the convection currents rising from the hot ground surface makes many lines that should be straight in the picture appear ragged and irregular. Nice. Another example came from Corindi Beach on the eastern coast of Australia. [The original link is no longer available, but the Wayback Machine provides a copy.] The observer, David James, provided a link to a [now also archived] map that shows where the pictures were taken; he says he was standing at the point where the arrow on the map meets the sea, about 7.2 meters above the sea. (Normal refraction would put his horizon about 10 or 11 km away; however, with the stronger refraction indicated by the mirage, it must be farther away.) The small island that is clearly visible to the right of the mirage in his wide angle shots is North West Solitary Island, about 7 or 8 km from the camera. The mirage was of North West rock, North Solitary Island and the dot on the map above North West Rock, all 25 km or more away. The pictures were taken between 6:11 and 7:47 a.m.; the temperature was 18°C, but rose to 33°C later in the day. (Probably this was also about the temperature of the hot air above the inversion.) The day was nearly calm — typical of conditions that produce strong inversions, and superior mirages. The date was 26 September 2003, which is early spring in the Southern Hemisphere — again, typical season for mirages in temperate latitudes. The nearby islands that are seen undistorted lie a little inside the observer's horizon; the miraged objects are beyond it. Pretty much a textbook example, I'd say. Thanks for the details, David! Mila Zinkova has a couple of large images showing mirages of the Moss Landing power plant from across Monterey Bay. The appearances on two different days are quite different. Here's a link to one, and a link to the other. In both cases, the ducting has produced multiple images, mostly very stretched vertically, below the strong inversion over the cold water. The difference in appearance seems to be due mainly to a higher inversion in the first example. Interestingly enough, mirages seem to be common enough across Monterey Bay that another site also discusses them, again featuring the Moss Landing power plant. In addition, there's yet another mirage of the Moss Landing power plant on Les Cowley's website. A number of mirages, both superior and inferior, have been photographed on the Plains of San Augustin in New Mexico, where the VLA is. There's an index to a collection of pictures taken there at http://astrophys-assist.com/vvla/vla_arch.htm; perhaps the best superior-mirage examples are http://astrophys-assist.com/vvla/vt001205.htm and http://astrophys-assist.com/vvla/vt001121.htm. Also, Marcella Giulia Pace has an interesting video of an inferior mirage in the Strait of Messina on a windy day, in which the water is so choppy that the waves almost completely hide the inverted image; but the vertical magnification at the fold line, and the exaggerated appearance of the waves at the water horizon (as well as the remarkable closeness of that horizon to the camera) are very well shown. Because atmospheric refraction is ordinarily quite small — usually only a fraction of a degree — these effects are not ordinarily visible to the naked eye. However, they are easily measurable with optical instruments, and so large that astronomers adjust the mountings of their telescopes to minimize the inconvenient effects of atmospheric refraction. The air near sea level is about a thousand times less dense than water; but that's still enough to change the direction of light rays that enter it from a different medium, such as the nearly empty space outside our atmosphere. And, because the density of the air changes continuously with height above the Earth, light rays within the Earth's atmosphere bend continuously as they pass from one level to another. Usually, the density decreases steadily from the ground up, so the rays (which always bend toward the denser material) are concave toward the surface of the Earth. You can see that the ray marked with a zero, which is horizontal at the observer's eye, is bent down appreciably below the horizontal where it passes the 9 km height above the Earth's surface. Even the ray that the observer sees at 20 minutes of arc above the horizontal is bent so that at 9 km, it's coming from a direction a little below the astronomical horizon. The rays are traced exactly for the Standard Atmosphere, for an observer 12 meters (about 40 feet) above sea level. The diagram above shows only the bottom 2/3 or so of the atmosphere, so it depicts only 2/3 of the total bending, which is about 34 minutes (just over half a degree) for a horizontal ray. Even though the vertical exaggeration of this diagram is about a factor of about 13 (compare the vertical and horizontal scales), the ray curvature and refraction are barely visible. And because the astronomical refraction, unlike the terrestrial refraction, increases rapidly with decreasing altitude, the lower limb of the Sun or Moon is raised up more than the upper one — so these objects appear slightly flattened near the horizon. You can see an example of this flattening produced by the Standard Atmosphere in the simulation of a “textbook” sunset. So far, we've considered only the Standard Atmosphere — a convenient fiction that is far from typical conditions, even though it is close to the average of a large number of measurements. The real atmosphere is never so featureless; all the complexities of reality have been averaged out here. Ordinarily, the real atmosphere has an irregular temperature profile, and the irregularities produce much more interesting refraction phenomena than we have seen so far. Although air is a thousand times less dense than water, and its refractivity is about a thousand times smaller, atmospheric refraction can produce effects that are sometimes easy to see, or even spectacular. Mirages and green flashes are the most striking of these effects. Mirages are multiple images formed by atmospheric refraction. (Other refraction phenomena include the ever-present small vertical displacements of everything we see — called terrestrial or astronomical refraction, as the displaced objects are on the Earth or in the sky — and the less common phenomena of looming and towering, or stooping and sinking.) I favor the usage established by Pernter and Exner in their classic book, Meteorologische Optik : refraction phenomena include such image distortions as looming and stooping, as well as everyday terrestrial and astronomical refraction; but “mirage” is restricted to displays in which two or more images of the same object appear. A similar division is used in W. J. Humphreys's book Physics of the Air. Another excellent discussion (in French) was published by Bonnelance (1929). An important theorem of atmospheric optics tells us that multiple or inverted images of celestial objects can only occur below the astronomical horizon. Thus, the height of the eye, which determines the dip of the apparent horizon, and thus the width of the zone of sky between it and the astronomical horizon, is very important for understanding mirages. Also, if an object is to appear inverted, rays from the top of the object must cross rays from the bottom of the object on their way to the observer's eye, so that the former arrive at the eye below the latter. Watch for such ray-crossings in the diagrams shown below, and in the additional mirage simulations. The commonest mirage is the “inferior” mirage — so called not because it is a poor example, but because the inverted image lies below the erect one. This is sometimes called the mirage of the desert, but today it is more appropriately known as the “hot-road” mirage, as it is seen on asphalt paving nearly every sunny day. The association with deserts is wildly inappropriate, as the name mirage was originally French sailors' jargon. Although these mirages are readily seen both at sea and on sand, they are really typical of smooth surfaces, and can be seen over ice and snow as well. Here an observer 5 m above the surface sees an apparent horizon with a dip of 6 minutes of arc, just as did the observer at 12 m in the Standard Atmosphere. But the apparent horizon is now only 4 km away; the circle of the horizon has apparently shrunk. If you place a vertical ruler between the observer and the apparent horizon, you will see that objects closer than the apparent horizon are nearly undistorted: the rays are about equally spaced at the object (the ruler). But beyond the horizon, the object is strongly distorted. For example, at 10 km, some parts of the object near the ground are invisible, and other parts are seen twice: the point where the rays marked −2 and −6 cross is seen at both these altitudes. Also, a small interval of the object appears to the observer to fill the interval from −3 to −5 minutes of altitude, and so is strongly magnified vertically. The whole interval of sky from −4 to −6 minutes appears upside down to the observer. As a vertical object recedes beyond the apparent horizon at 4 km distance, more and more of its lower parts disappear; and more and more of its upper parts are imaged twice, with the inverted image below the erect one. Note that, because of the curvature of the rays, even the erect image is displaced upward from its geometric direction from the observer. I saw a surface of water before me in which a low hill was reflected that extended along the opposite shore. I went toward this water. It disappeared before me, and I reached the hill with dry feet. When I had covered about half the distance, I seemed to Eschscholtz, who had remained behind, to have been submerged up to my neck in the reflecting layer of air, and, shortened the way I was, he said I looked more like a dog than a human being. As I strode onward, toward the hill, I emerged more and more from the layer of air, and I appeared to him, lengthened by my reflection, to get taller and taller, gigantic, slender. When land rises above the horizon, as seamen are wont to express it, the line that is taken to be the horizon is the edge of a reflecting surface formed by the lower layer of air and closer to the eye; a line that really lies below the visible horizon. I believe that this illusion in some cases can have an influence on astronomical observations and can cause an error in these of five and perhaps more minutes. For more ray-traces, with simulations of inferior-mirage images, go here. The textbook writers are fond of saying that the superior mirage is just like the inferior mirage, but upside down; that is, the “reflecting” layer in the atmosphere is overhead instead of underfoot. But that statement isn't quite right, because the curvature of the Earth can't be inverted, and it plays an important part in these phenomena. Furthermore, the inferior mirage is somewhat simplified because rays can't pass through the Earth. But when the “reflecting” layer is overhead, additional phenomena can occur because rays can penetrate far beyond it. Here's a ray diagram for a superior mirage. To make the “reflection,” I've put a little zigzag into the temperature profile of the Standard Atmosphere: there's a thermal inversion of 2°C between 50 and 60 m height above the surface. (This inversion layer is shaded in the diagram.) The observer is placed 54 m above the surface, just below the middle of the inversion. The ray curvature within the inversion is stronger than the curve of the Earth, which produces some remarkable effects. Before considering the details, let's look at the general features. There are really three different groups of rays, corresponding to three parts of the observer's sky. First, the rays well above the horizon are refracted more than usual — especially the lower ones (notice how the rays spread farther and farther apart as you go from 10 to 8 to 6 to 4 minutes of arc above the astronomical horizon). You can see that these three rays just oscillate back and forth in a limited interval of height, never reaching the top of the inversion layer. If these rays don't get out of the duct, they certainly don't get out of the atmosphere, so the Sun and Moon can't be seen through this band of sky parallel to (and centered on) the astronomical horizon. Notice, too, that these rays have their lowest points below the inversion. So the duct is deeper than just the inversion itself. And finally, notice that these trapped rays are always concave toward the Earth, even at the bottom of the duct: as Wegener emphasized, the curvature of the Earth makes this possible, as it bends down faster than the rays themselves do below the inversion. A careful look at the diagram shows that the three rays all cross about 20 km from the observer. Objects beyond this distance — say, 30 km from the eye — are seen inverted. This inverted image is the classical “superior mirage,” in which the inverted image appears above an erect image (formed by a third group of rays that will be discussed below). But the rays are “reflected” again, and cross again about 40 km from the observer, so that at 50 km an erect image is seen once more. Notice, however, that the crossings are gradually getting out of step, so that the image becomes progressively more distorted and eventually quite jumbled. This jumbling leads to the confused images of the Fata Morgana, a complex mirage display produced by strong ducts. The third group of rays lies below the duct, as seen by the observer. These are the rays marked with negative altitudes, from −4 to −10 minutes. Because they make considerable angles with the horizontal within the duct, they are not trapped, but are merely bent strongly within the inversion layer, and extend beyond it. There is a considerable angular gap at the top of the atmosphere between the first group of rays (above the duct) and the last group (which pass below the duct and back up through it, looking to the right in the diagram). Here's a cleaner view of these rays that cross the duct. Notice that the rays that the observer sees at altitudes of −4 and −6 minutes of arc actually cross, about 50 km away. So objects more than 50 km from the observer, and 100 m or so high, can be seen miraged (inverted). But there usually isn't anything but air for the observer to see in this region, so these mirages are not often noticed. However, beyond the atmosphere, there may be the setting Sun in this part of the sky; then it is miraged in what Alfred Wegener called the Nachspiegelung, or “late mirage” that appears after the Sun has “set” on the upper side of the duct and then reappeared below it. There are some examples of this mirage on the page devoted to simulations of ducted sunsets. One way to explain this mirage is to regard the denser air below the thermal inversion as acting like a simple convex lens, with a focal length of about 12 km in the example here. The mirage is then the inverted real image of distant objects that such a lens produces. There are other kinds of pseudomirage, all (so far as I know) associated with thermal inversions — though not all require ducts. In fact, Wegener's late mirage is possible, though weak, with an inversion layer too feeble to produce a duct. Thus the superior mirage always produces a late mirage, but the reverse is not true. Once again we have ray-crossing (look at the ray that was at −4 minutes' altitude at the observer: it is well below the three rays at −6, −8, and −10 minutes, and crosses all of them); so we have inverted images. This strongly-depressed ray enters the top of the inversion near grazing incidence, so it has the longest path in the inversion of any ray shown here. But the inversion is where strong bending occurs; so this ray is bent down the most. The others pass through the inversion more obliquely, and so have shorter paths in it, and less bending. As in Wegener's “late mirage,” this is a purely refractive image inversion. In fact, a similar explanation holds here: the dense air below the inversion acts like a lens, forming a real, inverted image of distant objects seen through it. So this is another example of a pseudomirage. We have called it a “mock mirage.” Like Wegener's late mirage, it really requires only an inversion, not actual ducting. Again, only distant objects above the base of the inversion can be seen miraged, so the mock mirage is rarely seen with terrestrial objects. 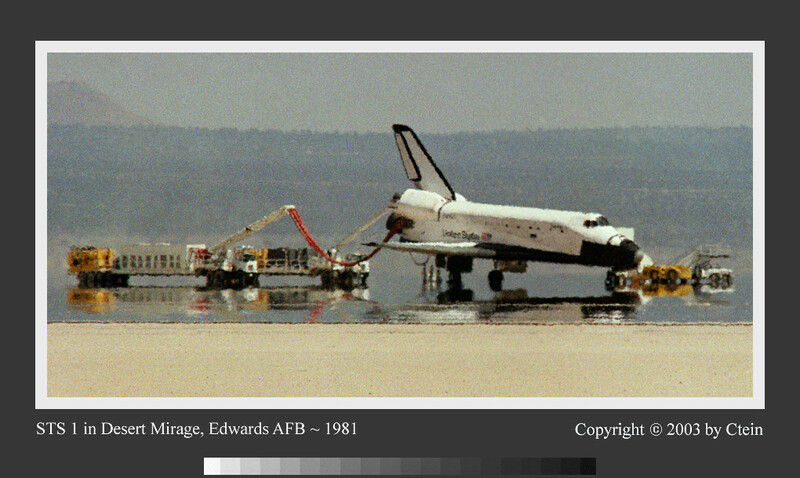 (To see what terrestrial mock mirages can look like, see their simulations.) But it is a common cause of low-Sun distortion, and a common kind of green flash. Such a green flash is shown in the sunset simulations. Still other mirages and green flashes can occur. But the ones shown above are certainly the most common. Pedants and purists insist that all mirages are purely refraction phenomena; and, strictly speaking, they are correct. Nevertheless, it is so useful to regard the classical inferior and superior mirages as approximately due to internal reflection that we cannot avoid considering that point of view — but with the caveat that certain subtle phenomena, which turn out to be essential for green flashes, are not explained by the “reflection” approach. Furthermore, one should bear in mind that the words for “mirage” in the most common European languages are all derived from terms meaning “reflection.” I have already pointed out that the French term “mirage” is derived from a phrase meaning “to be reflected.” In German and Dutch, the terms used translate literally to “air-reflection.” Thus the notion of reflection is implicit in every discussion of mirages — though Everett's term “quasi reflection” is closer to the truth. I think this close association of “reflection” with the classical inferior and superior mirages is a good reason to distinguish them from the “pseudomirages,” which are purely refractive. Still, one can regard all these inverted images as real images (in one dimension) formed by a positive lens. The finite focal length of the lens explains why there is a minimum distance to objects that are seen miraged. From this point of view, even the classical mirages are refraction, rather than reflection, phenomena. Now it begins to be possible to explain some common green flashes. The commonest is certainly the inferior-mirage flash. At the transition between the erect and inverted images of the inferior mirage, there is a zone of sky, parallel to the horizon, in which strong vertical stretching occurs. This broadens the Sun's upper green rim, which is normally too narrow to be seen without optical aid, into a feature wide enough to see easily. I have made some simulations that illustrate both the narrowness of the green rim in standard conditions, and its exaggeration into a green flash by an inferior mirage. Although many textbooks treat only what I might call the “classical” mirages — namely, the inferior and superior mirages — which are roughly describable in terms of total internal reflection of rays incident on a less-dense layer of air from a denser one, green flashes show that other mirage-like phenomena are equally important. Many of these (such as the mock mirage) are pseudomirages. The commonest of the pseudomirage flashes (namely, the mock-mirage flash) is illustrated in the simulations. Unfortunately, this turned out to be a more complicated problem than I had thought: the width of most mock-mirage flashes is due to the transitions between thermal inversions and the adjacent layers of air, and this structure presents difficult numerical problems — roundoff errors due to subtraction of nearly-equal quantities — that have been tricky and difficult to overcome. So only in late 2002 was it possible to present reasonably accurate simulations of the mirages and green flashes associated with thermal inversions, and particularly, with ducting. And the phenomena produced by ducts are so complicated that I have made a special page to show their effects on sunsets. Where do the thermal structures that cause mirages come from? They aren't in the Standard Atmosphere. There can also be “internal boundary layers” between large bodies of warmer and colder air. A good example is the cold pool of air that fills valleys at night: between this (which is produced by the nocturnal boundary layer of cold, dense air that slips down the hillsides as they cool by radiation to space) and the overlying warm air left over from the day before, there is a relatively sharp transition. Other sharp thermal boundaries — especially, strong inversions — are associated with weather fronts. Still others are produced by turbulent mixing, where there is wind shear. The result is that the atmosphere is full of thermal structures that are omitted from simple “textbook” idealizations like the Standard Atmosphere. The feature of these boundary layers that is significant for atmospheric optics is their steep temperature gradient. It is not uncommon to find changes of temperature of several degrees in a meter, or less. Because the density of air depends on temperature as well as pressure, these boundary layers are regions of steep changes in density — and hence, refractivity. Thus, these strong changes of atmospheric density are nearly always present. That means that mirages of some kind are nearly always present in the atmosphere, if you put your eye at the right height. Generally, the strongest optical effects require that the observer be close to the height of the thermal structures. Often, only the air itself is miraged, and the mirage is invisible (unless there are clouds at the right height to appear distorted). So, although mirages are nearly always possible, they aren't always visible; and many are so close to the limit of resolution of the eye that they usually escape notice. But an attentive person — especially, one armed with binoculars — can see these phenomena remarkably often. A reader of these pages has asked me about possible relations between mirages and sound propagation: in effect, “are there acoustic as well as optical mirages?” The answer is, “Sort of.” As the speed of sound depends on the air temperature, the thermal structures responsible for optical mirages also can produce peculiar sound propagation. However, the speed of sound is essentially independent of the air density (and hence, pressure); so the refraction of sound waves is quantitatively different from that of light waves. Also, the refraction of sound waves is strongly affected by wind shear, which is completely unimportant for light refraction. So, although there are similar phenomena in acoustics, you generally don't expect the acoustic “images” to resemble the optical ones. In particular, you can't expect to hear sounds coming from (optically) miraged objects. There's a lot of interesting information about sound propagation and thermal inversions in the atmosphere at Mike O'Connor's page on this topic. You can also get there from his main page by clicking on the “Information” item in the menu bar at the top. If you want to know more about mirages, I have a few recommended mirage references on the reading page. There are additional ray diagrams for ducts on the duct page. And some simulations are available for the commoner types of mirages. If you found my use of italics and boldface in links confusing, please read the page explaining this typographic convention. Didn't find what you were looking for? Try the glossary or the alphabetical index.